Another birthday weekend! We celebrated Lynn’s (Joe’s mom) birthday this weekend with dinner on Friday night and brunch on Sunday. Who doesn’t love an multi-day birthday celebration? Of course this meant more cake baking (Yay!). But this time, I had to take into consideration that Lynn is avoiding eating a lot of excess sugar these days. She was certainly not adverse to a little something extra-special and loves chocolate, so I thought that the occasion called for something dark, rich and only slightly sinful: The Flourless Chocolate Cake. It has its sweetness, but the chocolate is the star. I played around with a few recipes, not wanting to tromp all over the chocolate flavor with a lot of butter and eggs. This version came out fudgy, dark, and rich. For the icing, I chose a light and fluffy Italian meringue. You don’t need very much (I used a little more than half of the recipe) for a one layer cake. -Grease and dust an 8 in. spring form pan with cocoa. -In a saucepan over low heat, melt together the butter and chocolate and whisk until smooth. -Remove the chocolate/butter mixture from the heat and whisk in the sugar, vanilla, salt and then the egg yolks (one at a time) until smooth. -Sift the cocoa powder on top of the mixture and mix just until combined. -Beat the egg whites to stiff peaks and then gently fold into the cake batter. 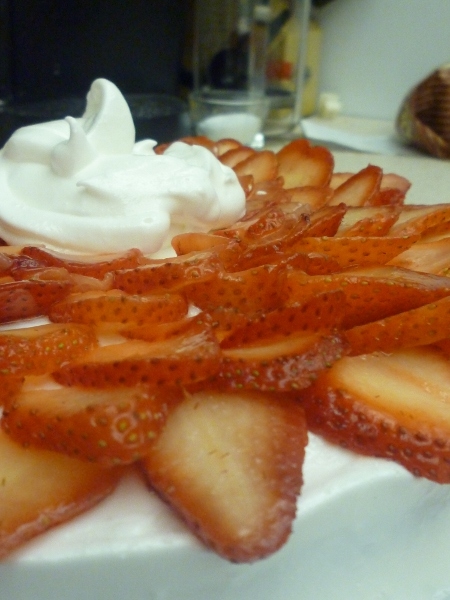 -Pour the batter into the spring form pan and bake for 25-30 minutes or until just set. Cool completely on a wire rack. -2/3 cup and 2 tbsp. sugar, divided. -Combine the 2/3 cup of sugar, water, and pinch of salt in a saucepan over medium heat. Swirl the pan gently until the sugar dissolves and then cook without stirring until the mixture reaches 230 degrees F.
-While the sugar syrup is heating up, beat the egg whites and cream of tartar until foamy and then slowly add the 2 tbsp. sugar. Beat until medium peaks form. -Once the sugar syrup has reached 230 degrees, remove it from the heat and allow the bubbles to dissipate. With the mixer on low speed, slowly add the sugar syrup to the egg whites and then increase the speed, add the vanilla, and beat until stiff peaks form. Normally meringue does not store well, but the addition of the cream of tartar meant that I was able to keep this in a sealed container in the refrigerator for a day without it beginning to weep or shrink. Place a layer of wax paper directly on top of the meringue to avoid condensation from getting into it. 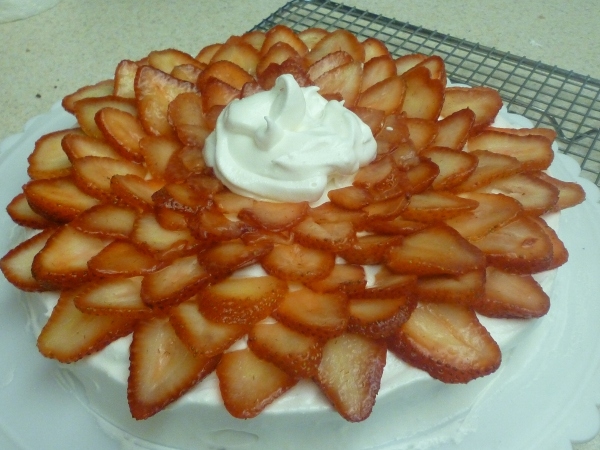 Spread an even layer of the meringue over the top and sides of the cake and then arrange sliced strawberries in overlapping circles. I wouldn’t recommend glazing them with anything as it will likely cause the icing to melt and spread. Enjoy—and happy birthday again, Lynn!